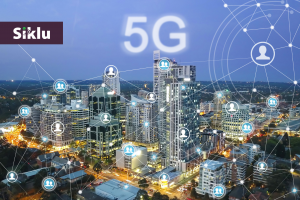 At Siklu we are going to break existing paradigms and illustrate how to provide 10Gbps Full Duplex connections using E-band for distances up to 6 miles. Broadband is coming to rural America! Just this past summer the FCC announced the winners of the CAF2 auction. The awarded service providers will take advantage of over $1.5B dollars to improve the quantity and quality of broadband in rural America. The main difference in this auction versus the CAFI auction lies in the number of smaller service providers among the winners. The FCC encouraged service providers to focus on solutions that enable low latency and gigabit speeds, using these two metrics as a part of the scoring formula. But even those who will end up providing capacities in the tens or hundreds of Mbps to the end customer, will definitely need a multi-gigabit transport to do so. A significant percentage of the transport infrastructure, in particular in rural areas, rely on the traditional licensed microwave (MW) installed on towers to backhaul the access network. These bands utilize narrow channels (25-50MHz) and typically are capable of providing just a few hundreds of Mbps which is clearly not sufficient to support the current capacity demands. At very high modulations you might get 1Gbps out of the MW link, but the range will be short and the equipment expensive. When it comes to $/Mbps mmWave technology outperforms MW by a large margin. 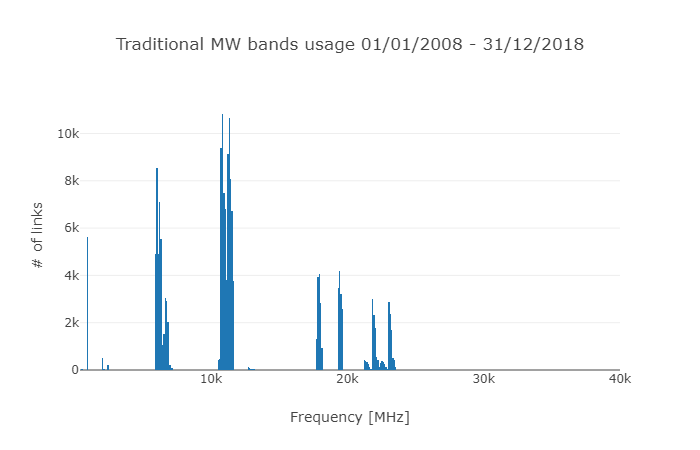 But the main challenge is the availability of spectrum in these bands in general. Since several service providers that serve pretty much the same areas utilize the same towers, there are few to no available channels left to deploy additional microwave radios in these traditional licensed bands. 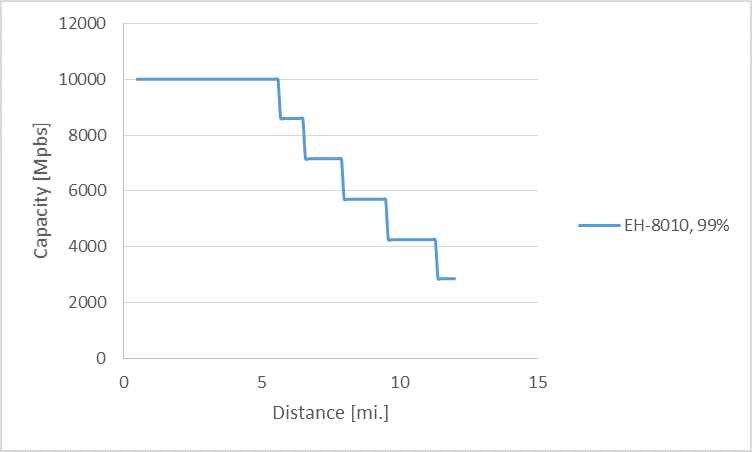 Distances in the wild, or not? When we talk about rural connectivity, we usually imagine a single tower standing there in the middle of a green field and only blue skies on the horizon. But is it really the case? 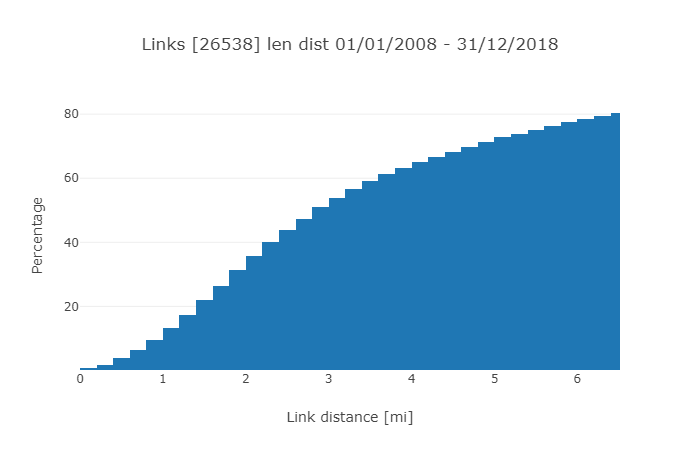 There are 26,538 links registered in the 18 GHz band in the US and 80% of them are less than 6.5 miles. 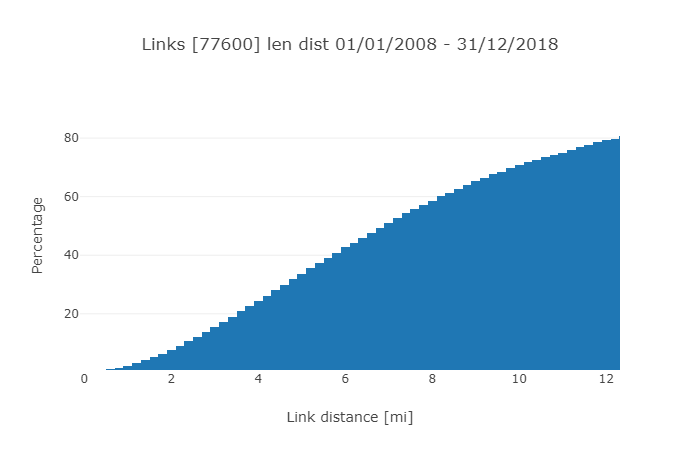 There are more than 77 thousand links deployed in 11GHz, while 80% of them are at the distances of 12.5 miles or less. Most of our communication devices (phones, home routers and satellites) operate in multiple frequency bands. The reason is that different bands have different physical properties and utilizing multiple bands enable communication devices to get the best of each in terms of range or capacity. Let’s apply the same principle to the microwave radios. We stated earlier that most of the traditional MW bands are congested, there are no available channels left and they will not provide the required capacity anyway. So the question is what band should we use? Millimeter wave wireless is the most trendy technology in the telco industry today due to the fact that no other spectrum can support speeds of 10Gbps Full Duplex. Along with traditional vendors, Internet companies like Facebook and Google have identified this technology as the next big thing in telecommunication. However, it is usually associated with dense urban environments and short distances. This is the paradigm we are going to break here! As shown in the figure above, the E-band radio will provide 10Gbps speed up to almost 6 miles at 99% availability. What does 99% availability mean? It means that for 362 days a year, the link will provide capacity as stated in the chart. For example, operating at 6 miles, the link will provide 10Gbps at least 362 days a year. This is great, but 99% availability is probably not enough for a transport link and customers will notice momentary disconnects. Higher availability up to 99.999% are required. The solution? Deploy a 10Gbps E-band radio on top of the existing MW link, which is not subject to high rain attenuation and can deliver higher availability over longer distances. This results in a multi band system capable of providing multi-gigabit capacity at a reach of several miles. How does such as system operate? In the case of a heavy rain where the E-band link may be experiencing an outage, the traffic will be rerouted from E-band radio to the MW radio with virtually no loss in traffic. When this momentary disruption subsides, often within seconds, the system will switch traffic back to the higher capacity E-band connection. With this approach the link will have 99.999% availability while 99% of the time providing 10Gbps Full Duplex capacity! Don’t need 10Gbps links? Think again – there are two reasons to deploy 10Gbps E-band links today. The first is to future proof your network. Even if you don’t need 10Gbps today, you will tomorrow. The cost delta between deploying a lower capacity E-band radio, and then rip and replacing in 3 to 5 years, vs future proofing your network and deploying the 10Gbps today is substantial. The second reason to deploy 10Gbps today in your transport infrastructure is simple. If you want to supply gigabit access to your end users, you need 10Gbps backbones. And it is clear that consumers as well as businesses want gigabit connections. Verizon FIOS and MSOs know this and are offering your potential customers gigabit access right now. Siklu radios implement sub 50ms hand off and support different capacity thresholds/configurations to reroute the traffic without any additional networking equipment. Our ExtendMM solution supports this functionality and is built into our E-band radios. If you are a service provider committed to CAF II deployments, you can utilize the dual band solution to increase the capacity of your existing backhaul and transport. 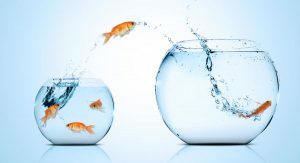 If you are a whole sale telco carrier, you can increase the capacity 10-fold over your existing transport and help CAF providers in connecting their access networks at gigabit speeds. Watch our webinar about how Rural Communities Can Get a Gigabit, Too!